Place sweet potatoes and red or white potatoes in a medium saucepan, cover with cold water by 1 inch, and season water with salt. Bring to a boil over high heat, then reduce to a simmer and cook until potatoes are cooked but still firm, 3 to 5 minutes. Drain and set aside to cool slightly. Meanwhile, in a small bowl, combine barbecue sauce, honey and chipotles. Divide mixture in half and set both batches aside. Thread pork, sweet potatoes, potatoes and scallions onto 8 12-inch skewers (pre-soaked in water if wood or bamboo). Prepare a grill to medium-hot heat and thoroughly oil the grate. Cook 2 1/2 to 3 minutes on each side, brushing with one batch of the sauce each time you turn, cooking until all 4 sides are browned, pork is cooked through, and the sauce is used up, about 10 minutes. 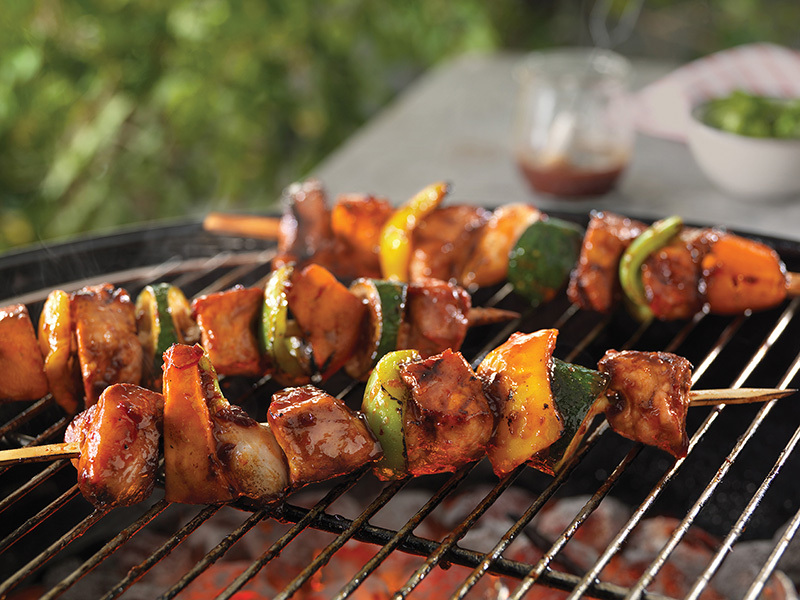 Transfer skewers to a platter and set aside to rest 3 minutes. Sprinkle skewers with cheese and cilantro. Serve hot with the remaining batch of sauce on the side.